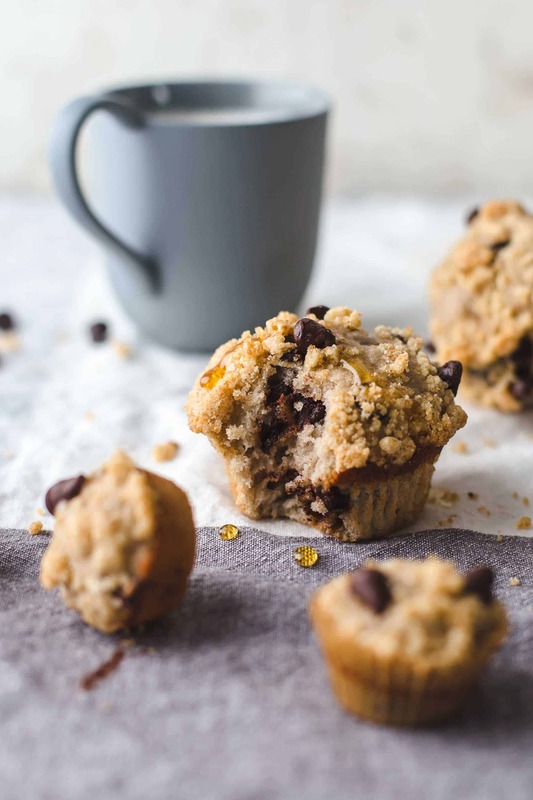 Enjoy these Banana Chocolate Chip Muffins for breakfast or dessert. Instructions for small batch or mini muffins, making them healthy, gluten-free, vegan, etc. provided. They are easy to make and call for 11 ingredients and 15 minutes of hands-on preparation time. They are super soft and moist and come with a crunchy streusel topping. 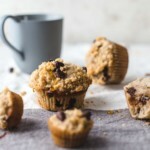 How to make the best Banana Chocolate Chip Muffins? You need three bowls. In the first bowl, combine flour, baking powder, and salt. 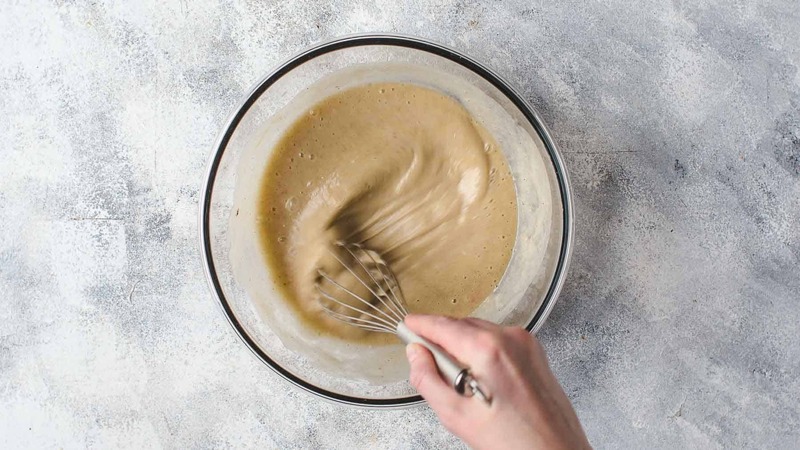 In the second bowl, whisk mashed bananas and sugar until combined. Slowly stir in oil. Then add eggs and vanilla. Add dry ingredients and whisk to combine. Fold in chocolate chips and banana chunks. The batter is thick enough that you can easily spoon it with an ice cream scoop or tablespoon into the liners. The muffins are made with oil what makes the muffins extra soft and moist. There is no milk in the muffins because the mashed bananas and the oil add enough moisture to the muffins that there is no need for extra milk. Don’t use an electric mixer for making muffins. Use a whisk and stir at every step just as long as the ingredients are combined. Muffins dry out when you overmix them. 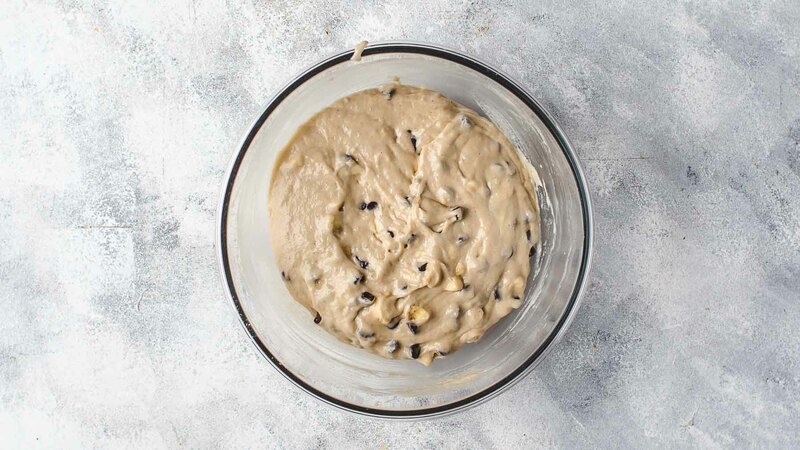 With mixing as little as possible, you make sure that your Banana and Chocolate Chip Muffins are super soft and moist. In the third bowl, make the streusel topping. 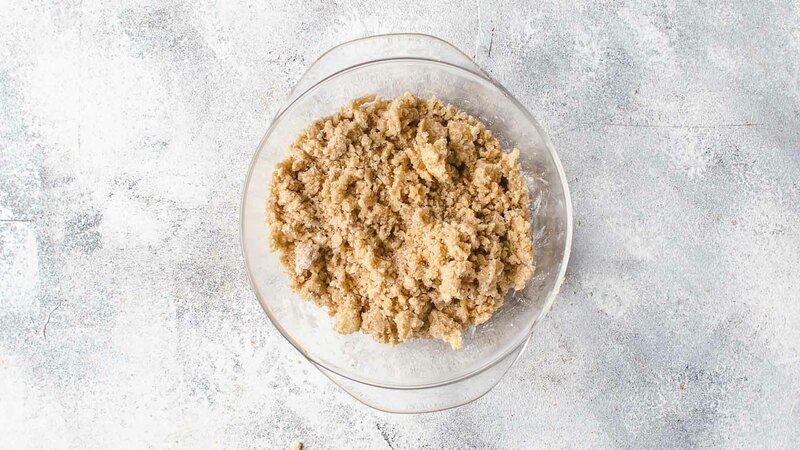 Combine flour, brown sugar, and butter with your fingers until it has a crumbly structure. This works best when the butter is very cold and cubed when combining it. Sprinkle on top of the batter evenly. Although you could leave out the topping, I have to say that the crunchy topping is irresistible and fits the muffins perfectly. Then spoon the batter into 19-20 muffin liners. 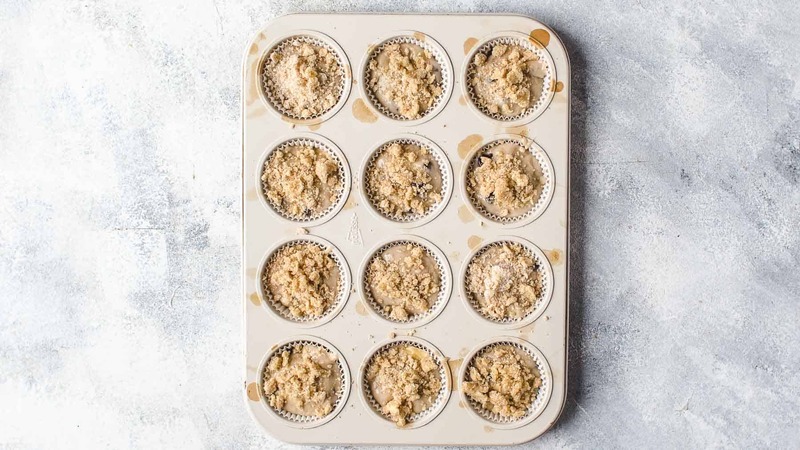 Use one or two 12 muffin pans. 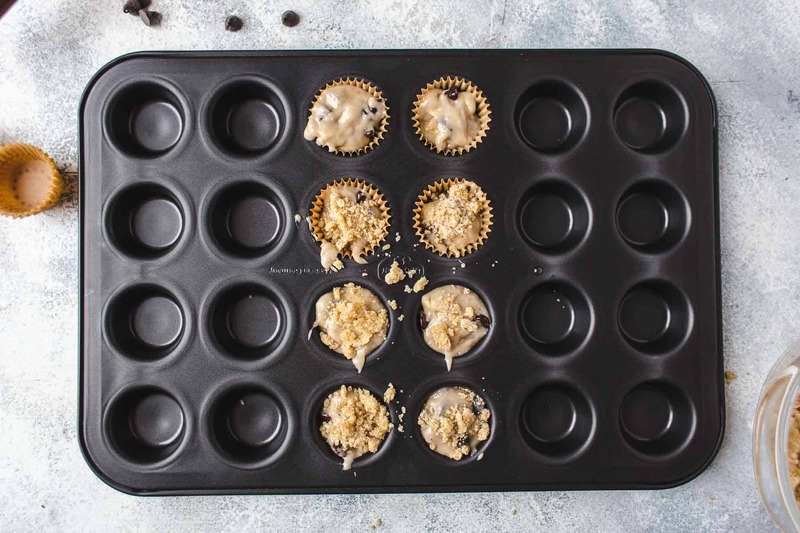 When you make mini muffins, spoon the batter into 55-56 mini muffin liners. Detailed baking instructions below. How to make bakery style high doomed muffins? Did you ever wonder why the muffins at a bakery store are always so pretty and high? High doomed muffins are so adorable, aren’t they? In fact, it’s a very easy trick to get them as pretty as from a bakery. The secret is a high baking temperature in the beginning. Preheat oven to 425°F (220°C) and bake the muffins for 5 minutes. After 5 minutes, lower the temperature to 350°F (175°C) and bake additional 11-13 minutes or until a toothpick in the center comes out clean. Baking the banana muffins for 5 minutes at high temperature lets them rise beautifully high right from the beginning. With the lower baking temperature, they still rise. But the higher temperature, in the beginning, is the booster. If you are looking for healthy, gluten-free, or vegan Banana Chocolate Chip Muffins, I got you covered. If you go for a healthier version, you might want to skip the crunchy sugar topping as well. Therefore, you could top the muffins with some chopped nuts for extra crunch. How to store Banana Chocolate Chip Muffins? You can store them in an airtight container at room temperature up to 3 days. If stored in the fridge, they stay fresh up to 1 week. However, they are best eaten at room temperature and in the first two days. Can I freeze Banana Chocolate Chip Muffins? As said, muffins are always best eaten fresh. However, if you plan to freeze the muffins, let them cool completely. Then wrap each muffin tightly in plastic wrap, one by one. Place the wrapped muffins in freezer bags and remove as much air as possible. They freeze well up to 3 months. To thaw, unwrap the muffins and place them on the counter. They need about 1-2 hours to come to room temperature. 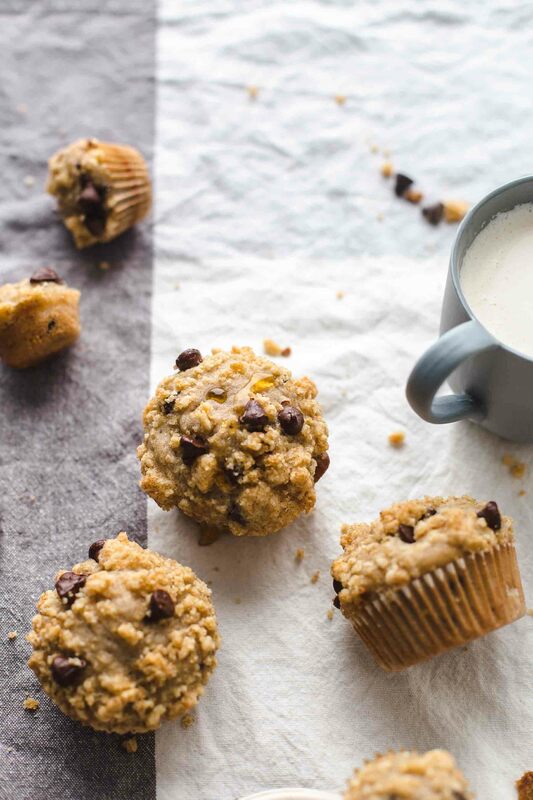 How to make a small batch of Banana Chocolate Chip Muffins? Oh, that’s an easy one to answer. Just divide the recipe in half. You will get about 10 muffins instead of 20. 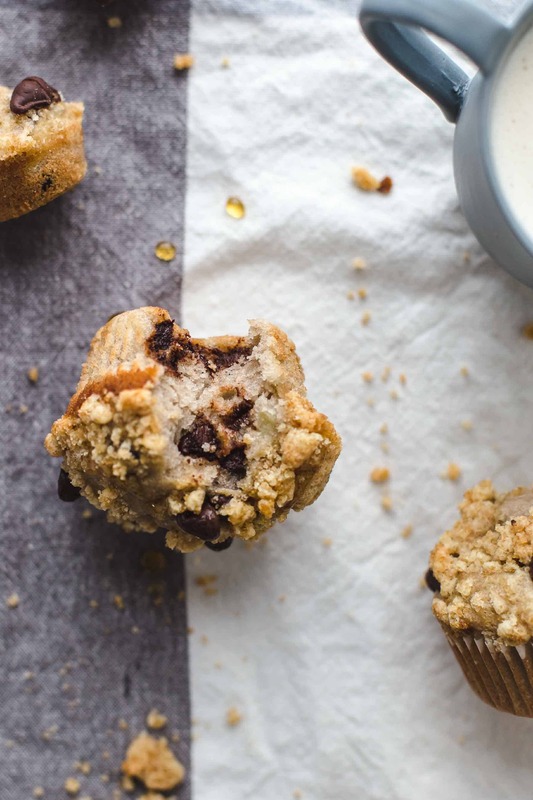 How to make Mini Banana Chocolate Chip Muffins? Make the muffins and the streusel as described. Fill the batter into about 55 mini muffin liners. Adjust the baking time as follows: Preheat oven to 350°F (175°) and bake for 6-8 minutes or until a toothpick in the center comes out clean. Be careful. Mini muffins overbake quickly because of their small size. Because of the short baking time, the baking temperature stays constant at 350°F from the beginning till the end. There is no high-temperature phase in the beginning. It would be too risky to overbake them, and then they dry out. Dividing the recipe by half leads to about 27-28 mini muffins. 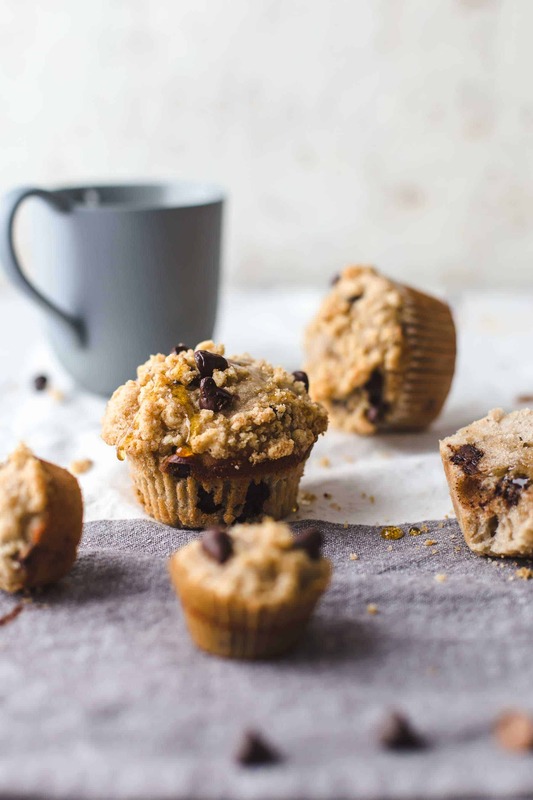 If you make this Banana Chocolate Chip Muffins recipe leave a comment, rate it and tag a photo #alsothecrumbsplease on Instagram! Would love to see your snap! Preheat oven to 425°F (220°C). Line two 12 muffin pans with about 19-20 muffin liners. Set aside. 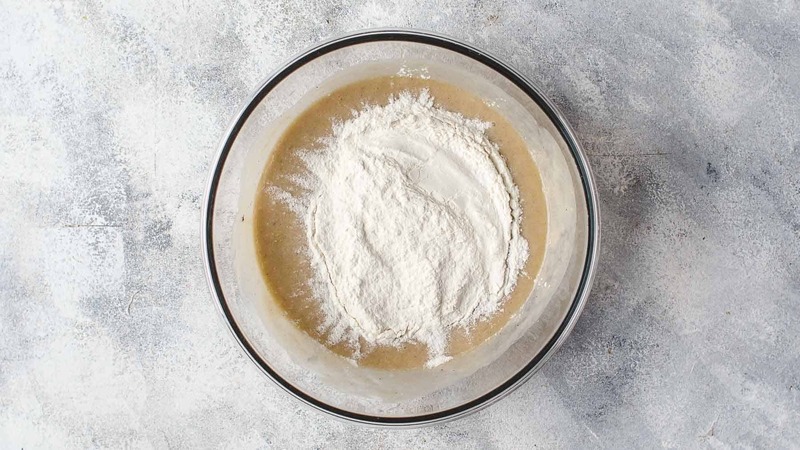 Make the muffins: Combine flour, baking powder, and salt in a medium bowl. Set aside. 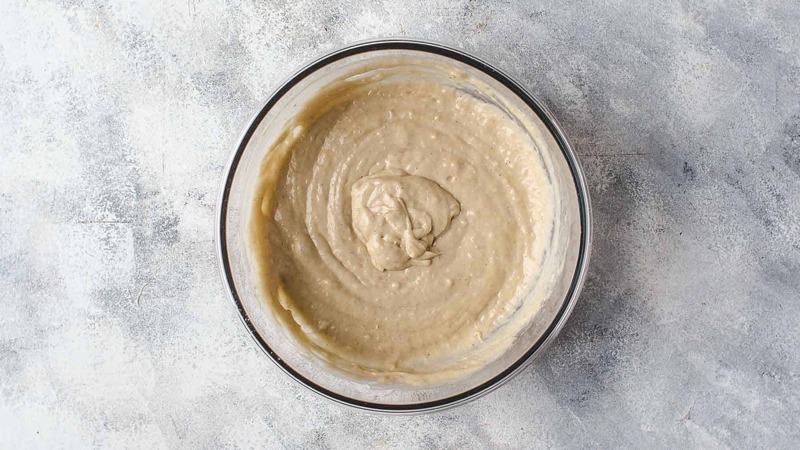 In a large mixing bowl, using a whisk, stir mashed bananas and sugar just until combined. Slowly mix in vegetable oil just until combined. Add eggs and vanilla* and stir just until incorporated. Add dry ingredients and stir to combine. Don't overmix at any step. Fold in chocolate chips and banana chunks just until combined. Set aside. 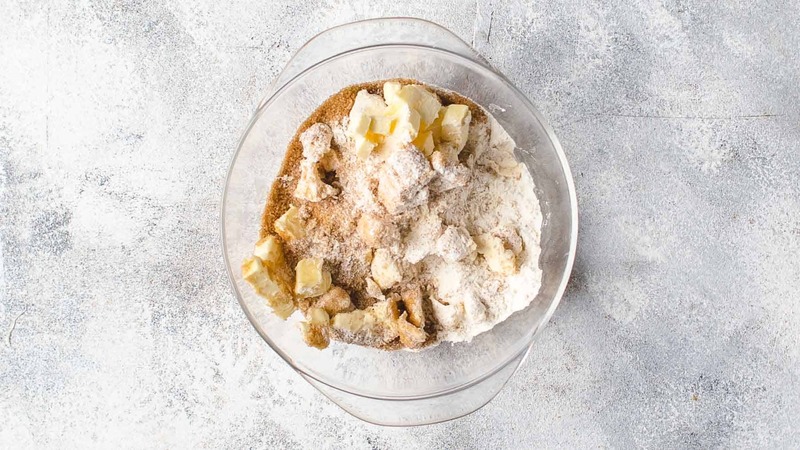 Make the streusel: In a medium bowl combine flour, sugar, and butter and mix with your fingers until you have a crumbly mixture. Assemble: Divide batter into muffin liners and sprinkle with streusel (and a few additional chocolate chips on top if desired). Fill liners between 3/4 and almost full. Look at the step-by-step photos above. You will get about 20 muffins. Bake at 425°F (220°C) for 5 minutes then lower the temperature to 350°F (175°C) and bake additional 11-13 minutes or until a toothpick in the center comes out clean. Don't overbake or your muffins will end up dry. Let cool for about 10 minutes then transfer to a wire rack to cool completely. Store leftovers in an airtight container at room temperature up to 3 days. 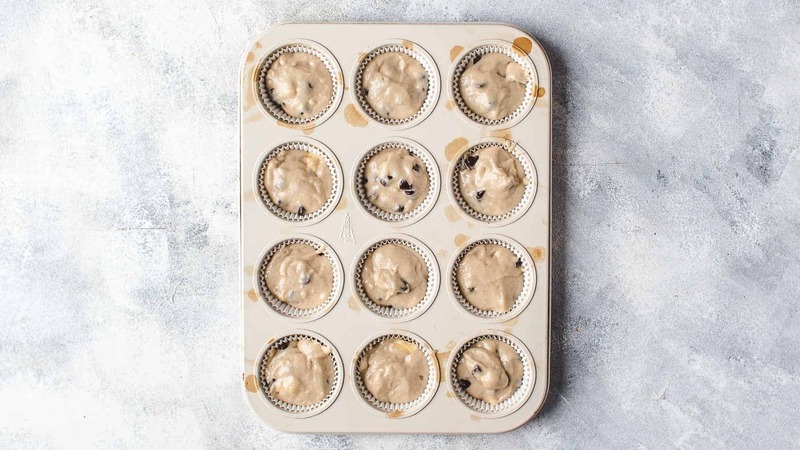 When you want to make mini muffins, line three 24 mini muffin pans with about 55 mini muffin liners. Bake mini muffins for about 6-8 minutes or until a toothpick comes out clean. Be careful, they overbake very quickly because of their small size. For small batch version, divide the recipe in half. Read the blog post for additional information on how to make, store, and freeze banana chocolate chip muffins. Watch the 1-minute video to see the whole process of making the muffins.